Moscow places S-400 'Growlers' in Syria's Latakia base, in an escalation that places Ben-Gurion Airport within range. Russia has revealed in photographs that it has deployed a highly advanced anti-missile system in western Syria, that is capable of downing planes taking off in Tel Aviv. The S-400 anti-missile system, known to NATO as the SA-21 "Growler," was shown to be stationed in the Latakia Airbase on the Syrian coast of the Mediterranean Sea in photographs released by the Russian military, reports the Daily Mail on Thursday. The S-400 is said to have a maximum range of 250 miles, and can bring down airplanes at up to 90,000 feet - more than double the height of a cruising commercial airliner. The range puts most of Syria, southern Turkey, the eastern portion of the Mediterranean Sea, much of Israel and the British airbase of Akrotiri in Cyprus within the scope of the missile system. No less than 300 targets can be tracked simultaneously by the radar complex of the S-400, which sports six anti-aircraft missile launchers. A Russian missile commander told Sputnik News that "even if a plane is flying low and with the same speed as a vehicle moving on the ground, the radar will show it on the screen. For the S-400 there is no such thing as 'stealth' aircraft, the system will see it and will shoot it down." 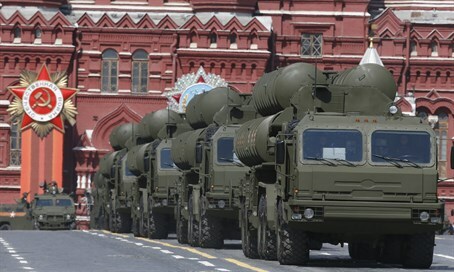 The revelation comes just after a Russian official on Monday said Moscow signed a deal with Iran to ship the advanced S-300 anti-missile system to Tehran. The controversial transfer will take place by year's end according to Iran, which could feasibly use the system to thwart strikes on its nuclear program.